Tinnitus, commonly known as ringing in the ears, is an issue that many hearing loss sufferers wrongly believe cannot be relieved. Each individual experiences tinnitus differently, but tinnitus increases during times of stress or unrest. Depending on how severe your tinnitus is, you can be irritated and distracted by the noise. Patients with moderate to severe tinnitus can even be immobilized by “tinnitus spikes” – which feel similar to a panic attack or anxiety attack. 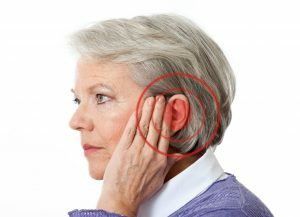 Unfortunately, too many patients wait for the tinnitus to go down on its own, or naturally fade away to tolerable levels. Left untreated, however, tinnitus can worsen into insomnia and the lack of concentration can leave you feeling tired and emotionally and intellectually exhausted. Some cases of tinnitus are caused by blockages in the ear canal. Our specialists can clean your ears using special cerumen (earwax) removal tools, cleaning the debris out of your ear. Tinnitus that occurs in sync with your heartbeat (pulsatile) can be a sign of an underlying medical condition, such as high blood pressure. Our medical screenings can help rule out health factors (including diabetes and thyroid problems) as a cause of your tinnitus. At the Hearing Center at Ear, Nose and Throat Associates, we use the most modern technology available to aid patients in dealing with their tinnitus, giving a thorough audiometric evaluation to all patients that come in complaining of tinnitus. Your audiogram will test the air and bone conduction in your ear, helping us determine the most effective course of treatment for you. Did you know that special hearing aids exist that help individuals with tinnitus overcome their symptoms? Many individuals reported feeling relief in tinnitus symptoms, and have been able to keep their “tinnitus spikes” in check thanks to special hearing aids. These hearing aids function as sound enrichment devices that play low-level relaxing background tones, known specifically as fractal tones. Our professionals have a profound respect for the power of human connection. We strive to ensure that patients are able to communicate effectively. The audiologists at the Hearing Center at Ear, Nose and Throat Associates can match you with the perfect device to ease the ringing in your ears. We also offer flexible financing to help you afford the device that will give you enhanced hearing, while also addressing your tinnitus. Call us at 727-304-6786 to schedule an appointment at a location convenient for you!